The teams that made the 2017-18 7DAYS EuroCup Top 16 mean business. Each group has a former EuroCup-winning side in it and there are many past finalists and semifinalists as well as numerous former All-EuroCup selections, too. After battling hard to reach this stage, every game counts in the six-round Top 16, from which only half of the contenders will reach the quarterfinals. Let’s look at the groups. 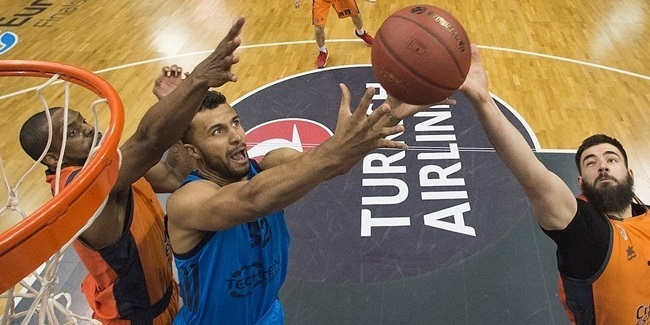 Group E features 2016 EuroCup champion Galatasaray Odeabank Istanbul and a pair of former finalists in Herbalife Gran Canaria and ALBA Berlin. There will also be a few big names manning the sidelines in Aito Reneses Garcia of ALBA and David Blatt of Darussafaka Istanbul. Offensive fireworks are certain to be on display with Gran Canaria serving as the top-scoring team in the regular season (92.5 ppg.) and Darussafaka fielding the top scoring player in Scottie Wilbekin (19.0 ppg.). Gran Canaria center Ondrej Balvin was the regular season co-leader in rebounding (8.4 ppg.) and shooting guard Marcus Eriksson (17.1 ppg.) was fourth in scoring. ALBA thrived on a balanced attack with five scorers averaging double figures and Galatasaray nearly matched that, too. Group A winner Darussafaka shined with the second-best defense (72.9 ppg. allowed) in the regular season and Galatasaray rolls into the Top 16 in great form after winning four straight games. ALBA also had a four-game winning streak during the regular season and Gran Canaria was one shot away from winning its group, so Group E is one that any of these four team can win. All signs point to lots of points being scored in Group F with three of the six top-scoring teams from the regular season: FC Bayern Munich (88.1 ppg., third), Zenit St. Petersburg (86.2 ppg., fifth) and Lietuvos Rytas Vilnius (85.9 ppg., sixth). And Fiat Turin topped the 90-point mark on three occasions. Group B winner Bayern was among the most-dominant teams in the competition, scoring the third-most points (88.1 ppg.) and allowing the third least (74.9 ppg.). After reaching the quarterfinals in each of the past two seasons, Bayern is primed for another deep run in 2018. Two-time EuroCup champion Rytas has one of the most experienced squads in the competition and in center Loukas Mavrokefalidis has the active Top 16 player with the most career points scored in EuroCup history, plus regular season assists leader Chris Kramer (7.0 apg.) to feed him the ball. 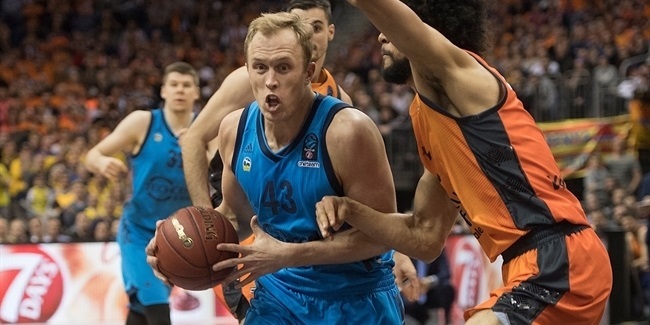 Zenit was the best offensive rebounding team (12.3 orpg.) in the previous stage thanks to regular season co-leader in rebounds Drew Gordon (8.4 rpg. ), while Sergey Karasev is the go-to guy on offense. EuroCup debutant Fiat rounds out the group, but with Diante Garrett and Lamar Patterson fueling the offense, the once-proud Italian giant won’t be satisfied with just participating. All four Group G clubs have left an impact on the EuroCup before, but only two of them will get to the quarterfinals this season. Group C winner Lokomotiv Kuban Krasnodar won the 2013 EuroCup and reached the quarterfinals last season. Dolomiti Energia Trento played in the 2016 semifinals, Cedevita Zagreb did the same in 2011, and Buducnost VOLI Podgorica reached back-to-back quarterfinals in 2012 and 2013. Undefeated Lokomotiv headlines the group with the best defense (71.0 ppg. allowed) in the competition, but is also fourth in scoring (86.3 ppg.) thanks to a lineup that features nine players averaging at least 8 points per game. Two-time All-EuroCup selection Mardy Collins offers the type of leadership necessary late in the season. Trento knows a thing or two about winning big EuroCup games; Dominique Sutton is one of four players back from its big run two seasons ago. Sixth-man Nikola Ivanovic is a rising star for Buducnost, which needed a Round 10 win over Lietkabelis Panevezys to advance. The Montenegrin champs won four of five home games in the regular season. Cedevita also dominated at home, where it has won four in a row. On a veteran roster, teenage forward Dzana Musa is a sparkplug for Cedevita. Group H may be the address for phenomenal individual performances. Grissin Bon Reggio Emilia guard Amedeo Della Valle was the regular season leader in performance index rating (23.0) and second in scoring (18.8 ppg.). UNICS Kazan big man Stephane Lasme was second in PIR (22.0) and led all players in blocks (2.5 bpg.). And ASVEL Villeurbanne guard John Roberson set single-game (11) and regular season (42) records for three-pointers and had the highest scoring game (42) in the regular season. And with a breakout season, Axel Bouteille (13.5 ppg.) of Limoges CSP would be in line for the EuroCup Rising Star award if he were just a few months younger. Group D winner ASVEL made noise as the second-highest-scoring team (89.9 ppg.) not only because it made the most three-pointer in the regular season (112), but because it was second in accuracy (43.2%). Limoges CSP, which had a winning record on the road (3-2) in the regular season, has averaged 92.2 points in wins, but a league-low 65.2 in losses. UNICS is a former EuroCup champion with a former (Lasme) and reigning (Jamar Smith) EuroCup winner on the roster. Reggio Emilia is more than a one-man show; former All-EuroCup pick Julian Wright is one of several vets eager to take this team far.